Many municipalities across the United States have taken measures to keep homeless people and panhandlers out of sight in public spaces. Legislators and government officials justify such steps as necessary to protect the public against unsafe or provocative conduct by “street people.” But some previous studies suggest that many Americans who have frequent interactions with street beggars see them in more benign and nuanced ways. To learn more, I did interviews and collected questionnaire responses from passers-by who recounted their reactions to recent interactions with beggars. 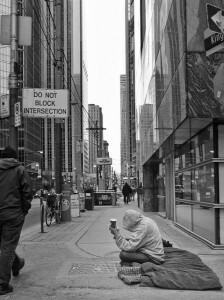 My methods allowed me to tap the meanings these interactions hold for people who pass beggars on the street – meanings not usually captured in quantitative studies. Results reveal that passers-by often see the fair treatment of beggars as a values issue – relevant to their own individual moral character – rather than simply a question of reducing public risks. Understanding the meanings community residents assign to the presence of homeless persons and beggars is essential if legislators are to enact ordinances that represent the true wishes of their constituents and at the same time protect needy people who need help. Starting in the 1970s, U.S. mental health facilities released patients with long-term illnesses and passed their ongoing care to community-based arrangements. Such “deinstitutionalization” contributed to increases in homelessness and vagrancy – which, in turn, spurred concern that homeless persons will engage in crime or uncivil behaviors. Beginning in the 1980s, scholars endorsed a policing strategy called the Broken Windows approach, which posits that physically repairing and cleaning city blocks can decrease criminal activity and bring city residents back to areas they had fearfully abandoned. Beggars and the homeless end up being targeted too, as public officials assume that everyday citizens using public streets find them threatening or generally distasteful.By criminalizing solicitation, authorities such as the New York Metropolitan Transportation Authority and the Times Square Business Improvement District have attempted to remove all signs of homelessness or vagrancy. Elsewhere, local governments have relied on ordinances and aggressive policing to keep beggars away from public spaces. Official actions to remove beggars do not necessarily reflect general citizen views, however, because my data show that individuals respond to begging in nuanced ways and only sometimes think in terms of avoiding risks supposedly posed by beggars. Although some respondents did speak of making special efforts to avoid interacting with beggars, people’s reservations were often tempered by their realization that they usually encounter beggars in familiar, well-lit, and crowded areas such as train stations and busy street corners. When approached for donations, many respondents reported that specific beggars were civil and respectful rather than threatening. This seemed to make it easier for respondents to empathize with familiar beggars. Tellingly, respondents often spoke in moral terms about their own personal responses to beggars. They saw their actions as an expression of their own moral character. Regardless of whether they chose to offer help or declined to do so, many respondents cared deeply about treating beggars fairly and responsibly. Respondents reported making considerable efforts to assess authentic needs behind requests for help, so as not to unfairly presuppose that all beggars are frauds. Some respondents cited obligation by religious principles or ethical injunctions to help all people who say they are in need, as long as there is no concrete reason to suspect bad faith. Respondents worried that giving money could worsen alcohol or drug abuse, but were quite willing to help beggars with food or other necessities. In localities with appropriate programs, they felt confident about donating vouchers that can be exchanged for food and basic supplies. Some respondents got to know street persons they came across daily; they learned their names and personal histories and came to see the beggars as peripheral members of their communities. 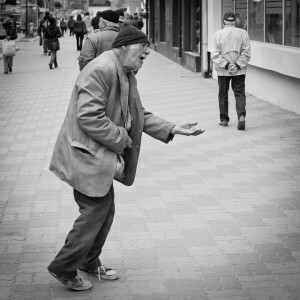 Even when unable or unwilling to make requested donations, some respondents felt remorseful or perplexed by the moral ambiguity of their encounters with beggars, reflected upon their experiences, and thought about ways in which they could behave differently in the future. In short, my study underlines that residents of American cities do not see beggars only as sources of anxiety and risk, but also as relevant, if marginal, members of their communities who should be treated fairly. This finding challenges claims by many officials that beggars are merely a nuisance or a public safety issue. Although individuals certainly differ in the extent to which they are personally willing to offer help to beggars, I found no empirical basis to believe that most Americans want beggars to be removed from sight. If public opinion is more diverse and morally complex than blanket dismissals of beggars suggest, then public policy responses need to become more nuanced. 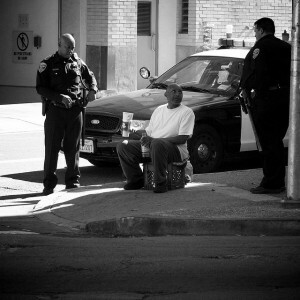 Criminalizing solicitation and subjecting all beggars to aggressive police actions not only impinge on the freedom and wellbeing of people in need; these crude approaches also contradict the moral understandings of beggars held by most settled residents and passers-by, who generally want needy persons to be treated with dignity. My work reinforces the previous finding that, as social contact with marginalized people increases, social perceptions of the vulnerable improve. Public officials will better reflect current citizen views if they avoid outlawing all solicitation and, instead, tolerate orderly beggars and stick to criminalizing only aggressive or disturbing behaviors. Read more in Shai M. Dromi, “Penny for Your Thoughts: Beggars and the Exercise of Morality in Daily Life.” Sociological Forum 27, no. 4 (2012): 847-871. Shai Dromi focuses on the ways beliefs about morality shape social life. His current research focuses on the emergence and institutionalization of long-distance humanitarianism.